Christina tried everything. 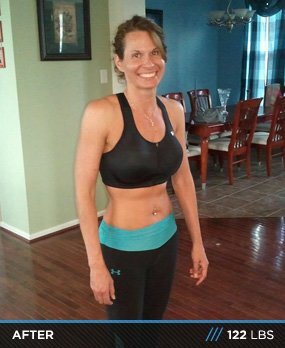 She shed 25 pounds on Atkins and 45 pounds on Weight Watchers only to gain it back every time. Then she discovered weights and went on a tear! Until I had my second child at age 26, I was able to eat anything and stay thin. I gained 12 pounds the first year of my daughter's life and I continued to gain from there. 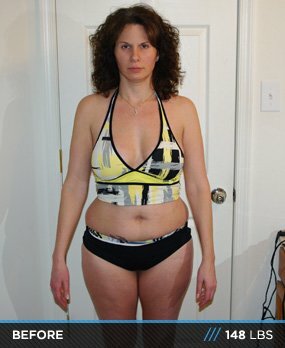 My first real try at dieting was in 2004 when my husband and I tried Atkins. I lost 25 pounds, but as soon as I began to eat normally, the weight packed right back on. In January 2007, after reaching my heaviest weight after the death of my cousin, I did Weight Watchers. I lost 45 pounds and was determined to keep the weight off for good. I lasted about six months until my doctor prescribed me a new medication that made me extremely hungry all of the time. I gained 17 pounds in six weeks. I yo-yoed from there trying different diets and occasionally adding cardio as my workout. As I was struggling to lose weight, my husband was steadily losing weight. He kept trying to give me advice on how I needed to change my dieting tactics and add strength training to my workouts. I didn't want to listen. Finally in January 2012, after gaining 15 pounds again, I became extremely frustrated and decided to change my whole approach to diet and exercise. I took my husband's advice and tried carbohydrate cycling and strength training. Before I started the diet, I chose to educate myself about the diet and read The Anabolic Solution by Mauro G. Di Pasquale, B.Sc., M.D. I learned how I should eat, how often, and how carb cycling works. I already belonged to the gym at work. I signed up for sessions with the personal trainer and committed to strength training four days per week. Following both a new diet and workout plan was difficult but it soon became routine. To stay on course with my diet, I purchased a diet journal and wrote down everything that went into my mouth along with the calories, carbohydrates, fat, and protein counts. The diary also had a place to write down my daily workout so everything was in one place. At the end of each week I would go back and read my entries for the week to see what I accomplished or if I needed to change something if I hit a plateau. After three months into my diet and exercise plan, I didn't feel that the weight was dropping off as quickly as I wanted. I chose to consult my husband's personal trainer/nutritionist. We reviewed my food diary and she helped me cut out excess fat from my diet. She also made adjustments to my carbohydrate intake. Finally, she gave me a more rigorous workout plan. The pounds started to melt off of me. I continued to document my eating and workout routines. When you write it down, it keeps you honest. That honesty helped me achieve something I told my husband would never be possible. A body with 14.5 percent body fat. My biggest challenge has been avoiding boredom of eating the same foods and performing the same exercises. I'm constantly reading fitness magazines, websites, and blogs to find new recipes to avoid eating the same foods. My personal trainer changes my workout plan every six weeks to keep routines fresh. My goal is to continue building muscle. Though I have no desire to enter a fitness competition, I want to look like I could. I know I still have a long road to travel, but I'm dedicated to reaching that goal. Don't be afraid of weight lifting. Women ask me all of the time what my exercise routine is and expect me to rattle off a list of cardio exercises only to be surprised I lift weights. Cardio alone will not transform your body into the one you desire. Don't be afraid of the high protein-low carbohydrate diet. I explain my diet to women all of the time only to be told she could never to that diet. It's an adjustment, but your body will adapt and soon you won't miss white bread and rice. Finally, keep a journal. If you write everything down, you'll know exactly how much you have eaten and can more accurately count your calories, protein, carbohydrates, and fat. Bobdybuilding.com provides me with protein and supplement needs. I enjoy reading their articles for inspiration and guidance. I enjoy BodySpace to look up members stats to compare to my own.